Detroit Day of Azure is coming! As always, there will be a lot of developer conferences and other events this summer in the my region. Here is a partial list of conferences that have been announced in or near the Heartland region in the coming months. Please let me know if I have missed any. Saturday, I spoke at the Orlando Code Camp at Seminole State College, just east of Orlando, FL. This was the seventh year of the Code Camp but my first time attending. The first session I attended was Memory Management Fundamentals – Garbage Collection Deep Dive by Scott Dorman. Scott explained the way memory management works under the hood. The garbage collector takes care of cleaning up objects when they are no longer needed. It's generally not advisable to implement a finalizer. If your machine has plenty of memory, garbage collection might not occur until the user exits the app. Larger objects are cued up for cleanup. I planned to see Richie Rump's Entity Framework - Code First and Magic Unicorns session, but others had the same idea and the room was packed. Rather than stand for an hour, I opted to hear Greg Leonardo's Line of Business development with MVC3. This was a basic overview of how to use MVC. It consisted of more slides than demos. He did explain how MVC's Anti-forgery library works (issues a token to the user with a response and checks for that token in subsequent requests). He also discussed the MVC Anti-XSS library, which is designed to protect your site against cross-site scripting errors. By default, MVC disallows HTML input by. If you decide to allow HTML input, it is important to scrub input with the Anti-XSS library. I delivered a session on Visual Studio 2010 Database Tools. It was very well received and the audience asked lots of questions. The conference was organized by local user group leaders, including Esteban Garcia, a fellow Telerik insider (Telerik sponsored my trip, BTW). The organizers did a very good job on this conference and everything ran smoothly. The one drawback of this event was the lack of an obvious common area, where attendees could talk and meet one another. When it was over, we regrouped at a local pub, which gave me the opportunity to meet many of the local developer community. This was particularly important to me at this conference because I only knew about 5 people among the speakers and attendees. One of the reasons I came down to Orlando was for a chance to meet people in the local Florida communities. It turns out that Orlando, Sarasota, and South Florida have very vibrant communities based on the enthusiasm of those I spoke with. The Orlando Code Camp will take place again next year and I'm seriously considering making this an annual trip. I also heard of a few smaller events in the area which might bring me back here. The Detroit Day of Azure is history and I had a blast. On March 24, a group of volunteers and I organized the first Detroit Day of Azure, with the idea of sharing knowledge about Microsoft’s cloud computing platform and related technologies. We sold out our 144 tickets and about 130 people showed up for the Saturday event in Southfield. The speakers were amazing. They traveled from Texas, Minnesota, Indiana, Chicago, Ohio, and Kentucky to share their knowledge with us. The feedback I heard was all positive. I was fortunate to get such a talented group of presenters. We ran 3 rooms simultaneously. The presentation in the large room was streamed live all day, so people who could not make the conference could enjoy the presentations. We ran a Q&A Panel at lunch time titled "Ask the Experts". 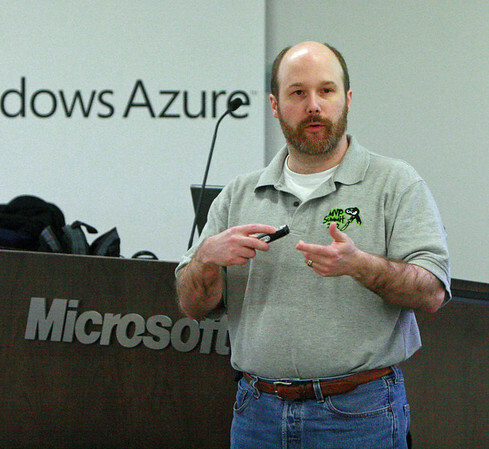 Nearly all the speakers participated and the audience got to ask them questions about Windows Azure. We cut this off after about 50 minutes, but could easily have gone twice as long. Everyone loved the food. Lunch was from a local barbeque restaurant and featured some outstanding brisket, pulled pork, and chicken, along with some tasty side dishes. We also provided continental breakfast and an afternoon snack, both of which disappeared in a hurry. Most of the sessions were recorded, thanks to volunteers Jim Priore, Falicia Starr, and Max Friend, who manned the cameras. I'll get these online in the next few weeks. The volunteers were fantastic. People were proactive about seeing what needed to get done and jumping in and doing it. I had very little to manage on the day of the event. Speakers and volunteers retreated to Copper Canyon Brew Pub for dinner afterwards. It was nice to wind down with friends after a busy day. I couldn't find the wireless microphone for the lunchtime panel, which meant only half the room could hear them well. I ordered way too much barbeque and we ended up with more leftovers than I would have liked. But those are small things and I was overall pleased with how everything turned out. I need to catch my breath before thinking about the next event. Below are some links to download or sign up for some of Microsoft’s hottest new technologies. On March 20 (tonight), I will present Persistence In The Cloud: How to Use Azure Storage at the 24 Hours of Pass online conference. Here is a link. On March 24, I will present Persistence In The Cloud: How to Use Azure Storage at the Detroit Day of Azure in Southfield, MI (http://DetroitDayOfAzure.com). On March 31, I will present Using the Database Tools of Visual Studio 2010 at the Orlando Code Camp in Orlando, FL (http://orlandocodecamp.com/). On May 4, I will present Data Visualization: The Ideas of Edward Tufte at Stir Trek in Columbus, OH. (http://stirtrek.com/). Cloud computing has been a hot topic in the software industry for the past couple years. Many of us hear about cloud technologies such as Windows Azure, but don't know how to get started. I wanted to make it easy to find that information, so I'm organizing a 1-day conference to teach people about Windows Azure. 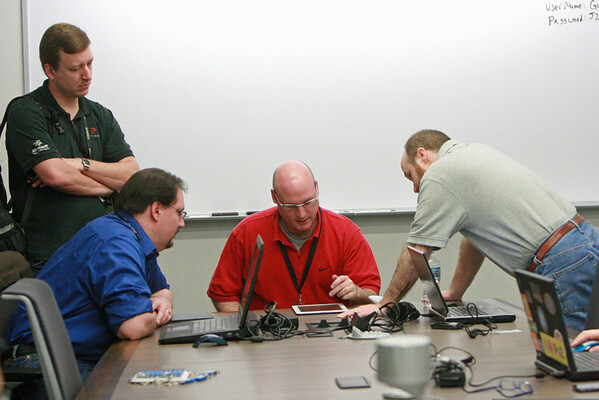 The Detroit Day of Azure will take place Saturday March 24 from 8AM to 6PM at the Microsoft office in Southfield, MI. 14 speakers from 8 different states have agreed to deliver 19 presentations at this event. The speakers (listed below) are among the foremost Azure experts in the region. The list includes MVPs, Microsoft insiders, book authors, and people delivering real Azure solutions for their customers. Azure MVP and Sogeti National Cloud Computing Lead Brent Stineman will deliver the keynote; then we will split into 3 rooms for the rest of the day, where you can choose from several great topics and speakers. Our plans are to record at least some of the conference on video. We may even live stream some of it, but that is still in the planning phase. We will designate one room for programmers to build Azure applications. Attendees can bring a laptop and either work on their own project or work through the Azure labs, which we will provide for you. Many smart people will be around if you get stuck. Remember to download and install the Azure SDK and sign up for a free Azure Trial before you arrive! As with any successful event, many people helped out. Onorio Catenacci, Jamie Altizer, Matt Ruma, Shelly Noll, Sukhdev Tur, Justin Baker, Akhil Mahajan, Brian Korzynski, Jelard Macalino, Jim Priore, and Falicia Starr have volunteered their time to help; while Microsoft, Sogeti, The Epitec Group, Telerik, and RIIS donated their money; while Pluralsight, Wrox, and O'Reilly donated products to give away. If you have been attending the Great Lakes Area .NET User Group (where I was president the last two years), you won't be surprised to learn that we are serving some excellent food at this event. Included in the $20 admission cost is a continental breakfast and a buffet lunch from Lockhart’s barbeque in Royal Oak. We will also have some door prizes to give away at the end of the day. More information on the Detroit Day of Azure is available at http://DetroitDayOfAzure.com. You can register at http://DayOfAzure.eventbrite.com/. Space is limited and only a few tickets remain. I'm very excited about this event and looking forward to it as an organizer, as a speaker, and as an attendee.